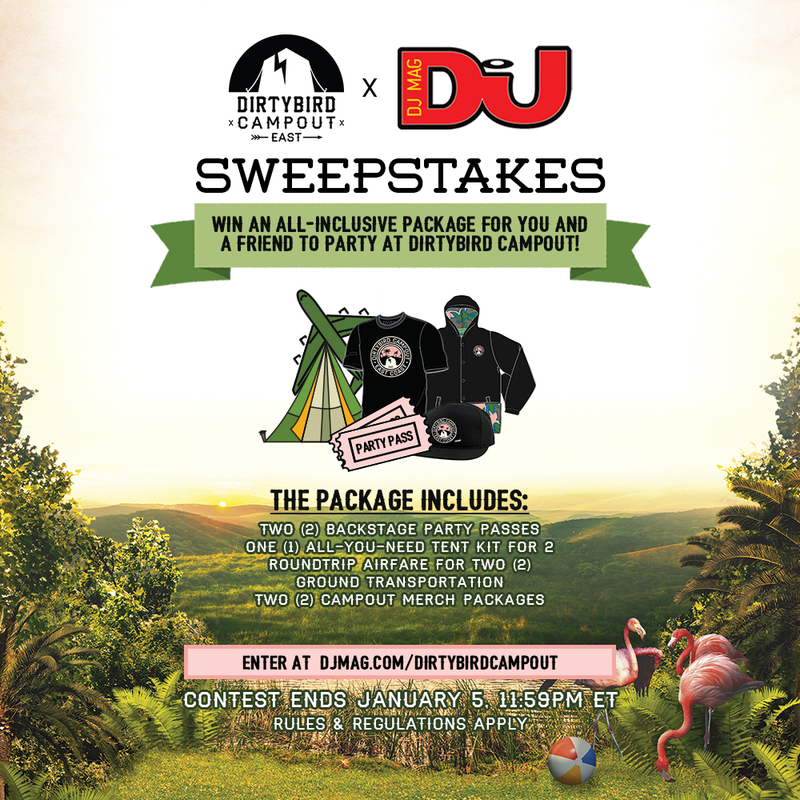 Dirtybird Campout East are offering two lucky people the chance to win a bumper package for their 2018 festival, including two backstage passes, free transport to the festival (open to U.S. and international residents), and an 'All-You-Need' Tent Kit, featuring a ready-to-use tent, a Queen sized air mattress and air pump, two sleeping bags and even two pillows to rest their weary heads on after a long day and nights worth of partying. And if that wasn't enough, the two winners will also be looking fresh with their Dirtybird Campout Merch Kits, including two t-shirts, two jackets and two hats from the Dirtybird Campout merch line. All you need to do to enter this unreasonably generous competition is send an email (with the subject Dirtybird) with your full names, address and contact number to competition@djmag.com to be in with a chance of winning. Just FYI, you and your plus one must be over 21, and also both be able to legally enter the United States. - 2 (two) Dirtybird Campout East Coast 2018 “Backstage Party Pass” tickets. These tickets allow general access to all parts of the festival, and additional access to ‘backstage’ areas with separate bars, bathrooms, and lounge areas. - Dirtybird Campout Merch Kit for Two. Kit will contain two t-shirts, two jackets, and two hats from the official Dirtybird Campout East Coast merch line. Women’s and men’s sizes available. 1. To enter the contest, you must be 21 years of age or older by February 1, 2018. You must also enter your legal name and a working email address. 2. Winner must choose a guest who abides by Rule 1. Both Winner and Guest must legally be allowed to travel into or in the United States. 3. Anything not explicitly described as part of the prize and in the rules below is NOT included in the prize, and any expense incurred outside of Prize assets is the sole responsibility of the Winner and/or their Guest. 4. The Sponsor has exclusive control over all parts of the Sweepstakes. 5. Please use your personal email address, one that you have permanent and solitary access to, so there can be no doubt. For further terms and conditions, click here. 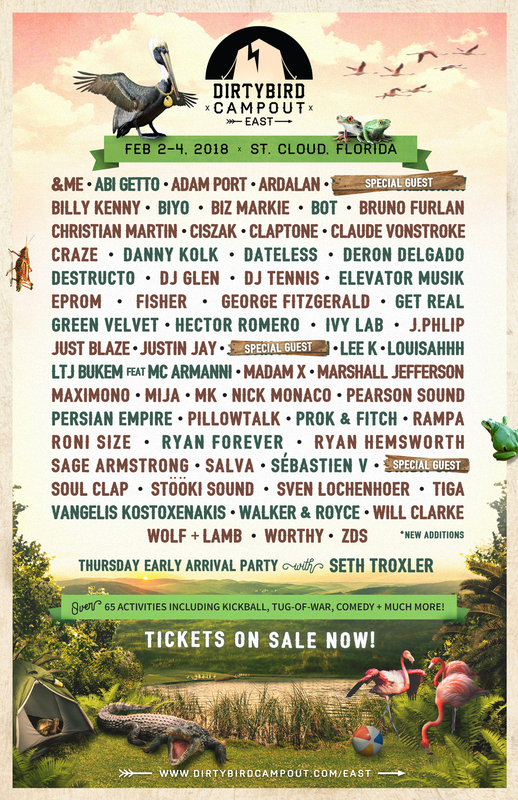 Check out the full line-up so far for Dirtybird Campout East below. WIN! HUGE BUNDLE FROM NOVATION & FOCUSRITE WORTH OVER £1,300! WIN! MASCHINE STUDIO, KOMPLETE GEAR & PB COURSE WORTH OVER £2K!